Waterproofing bathrooms IS OUR OLDEST DISCIPLINE. 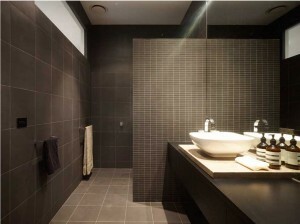 Our waterproofing membranes have been installed in countless bathrooms throughout Melbourne and beyond. The first step of waterproofing internal areas is the application of a graded cement floor screed. A three-layered membrane is then installed. Our carefully installed waterproofing membrane is designed for maximum flexibility. All aspects of our installations, including shower wall niches, windows, and ledges are meticulously detailed to ensure they are waterproof and easy to tile. Flex A Seal’s internal wet area (IWA) membrane systems can be easily tiled over using generic compatible tile adhesives. Tilers are our partners and our men love it when a tiler that is new to us compliments our work because we made his job easier. 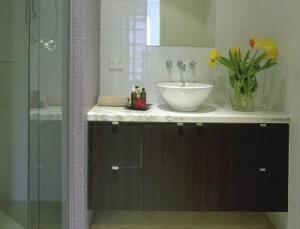 We can waterproof bathroom, laundries, and powder room floors, and bath frames, including around all relevant fittings. All shower walls and bath splashbacks are waterproofed to a minimum height of 100mm above the showerhead or faucets. General bathroom, laundry, and powder rooms are waterproofed to form an impervious tray a minimum 70mm in height, with reinforcements to the waterproofing membrane applied to all joints and corners. True to our name, all our membranes are installed so they remain flexible, an important feature with today’s light-weight construction methods. To deliver the best in performance, our systems are made of the highest quality materials, namely CLASS 3 Latex-based membrane emulsions with an elongation factor of 300%, exclusively manufactured to achieve our desired standards. By the way, CLASS 3 means the membrane, once cured, will never emulsify which is, invariably, not the case with standard acrylic membranes. All our installations are compliant with current Australian Building Standards: A.S.3740 and Building Code Australia: B.C.A. Vol.2 Part 3.8.1. As part of our services, Flex A Seal’s pre-works inspections or tender submissions based on quantitative assessments from architectural plans is followed by the quality-assured installation schedule with a Certificate of Compliance issued by Flex A Seal to the procurer. The certificate is transferable to current or future building owner[s]. All our waterproofing installations are supported with a peace of mind, Ten Year Performance Warranty.